When the "Always Append" option is enabled, Win2PDF will automatically append to any existing document that matches the Auto-name format. This option is not available for Win2Image, or when security is enabled in Win2PDF Pro. Depending on the other options selected, the "Always Append" option will append until the date and/or time changes. A new file will be created if an existing file with the same format does not exist. For example, if the "Include Date" option is selected with a "Month-Day-Year" format, the "Always Append" option will append to the same file when it was created on the same day. The following day, a new file will be created. If the date format is set to "Year Only", a new file will every year. 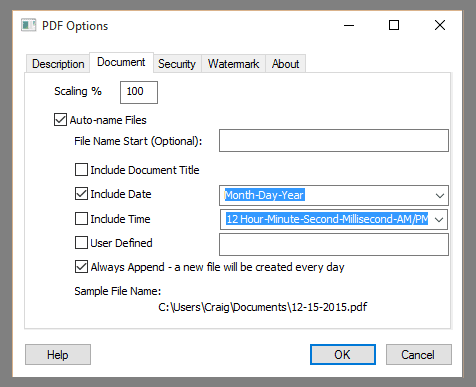 If no date or time options are enabled, Win2PDF will always append to the same file. The description following "Always Append" is updated to indicate how often a new file is created. This option can be combined with any of the other auto-name options.